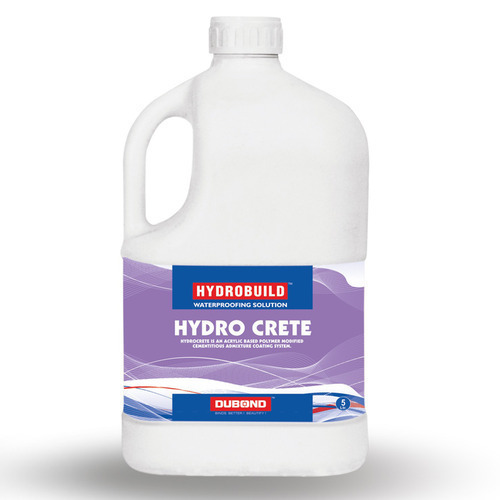 Dubond’s Hydro Crete is an acrylic emulsion which when added to cement mortar / concrete / grout provides good adhesion, water resistance and improvement of other properties. It is available in form of a milky liquid. Concrete surfaces should be sound and clean, free from oil, grease, cement laitance & loosely adhering particles. Absorbent surfaces should be saturated thoroughly with water but without showing any puddle on their surfaces. 1ltr, 5 ltr & 20 ltr container. & protected from direct sunlight. Protect from frost. Packaging Details 1 Ltr. 5 Ltrs. 10 Ltrs. 20 Ltrs. 200 Ltrs. The established in the year 2009, We, Dubond Products India Private Limited, are the manufacturing, exporting of Water Ceiling Product. Our product range includes Tile Adhesive, Glass Mosaic Tiles, Wall Texture, Wall Putty, Cement Grout, Epoxy Grout, Swimming Pool Tiles, Epoxy Flooring, Block Fix Adhesive and more. The offered range of products is manufactured by taking quality assured components and innovative manufacturing methods under the supervision of our adroit professionals. All our products are made as per the industry laid standards and norms. These products are highly appreciated across the market for their premium quality and long shelf life. We export our products all over the world. We are committed to offering superb quality products to our respected clients. For this, we have appointed a team of well qualified and experienced professionals who are well versed with this domain. These professionals hold expertise in manufacturing these products as per the client’s detailed requirements. Empowered by a modern and well-equipped infrastructure facility, we have been able to execute our business operations in most efficient manner. In order to tune up with the ever changing technology, we have established an in-house research and development unit. Owing to this, we have earned a huge client base in short period of time. Under the continuous supervision of our mentor and director, Mr. Bharvin Patel, we are able to cater the vast clientele across the globe. Backed by us excellent management skills, we have been able to attain a Distinct and dynamic position in this domain.